© 2016 Jukka Salmela, Anna Suuronen, Kari M Kaunisto. The genus Boletina is a species rich group of fungus gnats. Members of the genus are mainly known from temperate, boreal and arctic biomes. Phylogeny of the genus is still poorly resolved, dozens of species are insufficiently described and undescribed species are often discovered, especially from samples taken from the boreal zone. Four new species are described. Boletina valteri Salmela sp.n. (Finland), Boletina kullervoi Salmela sp.n. (Finland), B. hyperborea Salmela sp.n. (Finland, Norway, Sweden, Canada) and B. nuortti Salmela sp.n. (Finland). Boletina arctica Holmgren is redescribed and reported for the first time from the Canadian high arctic zone. Boletina borealis Zetterstedt and B. birulai Lundström are reported for the first time from Canada. Boletina subnitidula Sasakawa (syn. n.) is proposed as a junior synonym of B. pallidula Edwards. The genus Boletina Staeger, 1840 (Staeger 1840) belongs to the family Mycetophilidae and its subfamily Gnoristinae (Väisänen 1986, Rindal et al. 2009, or Gnoristini sensu Edwards 1925, Söli 1997). There are 137 recent Boletina species, of which 99 are Palaearctic, 11 Oriental and 34 Nearctic. Only seven species have a Holarctic range and 74 of the Palaearctic species are present in Europe (Suppl. material 1). It should be noted that the numbers presented above are expected to increase, as several Fennoscandian species await description (Fig. 1) and in the Nearctic region the genus is very poorly known (Taber 2011, Taber 2013, J. Salmela pers.obs.). Furthermore, 31 (23 %) out of all described species either are known only from female specimens or their descriptions are too deficient for an understanding of their morphology and thus allowing positive identification of the taxa (Suppl. material 1​). In Europe the genus seems to have an increasing number of species toward higher latitudes, that is, there are more species in Fennoscandia than in either Central Europe or the Mediterranean region (Fig. 1​). The boreal zone may harbor the highest number of Boletina species, but several species are also known to occur on the subarctic and Arctic zones (Lundström 1915, Zaitzev 1994, Polevoi 2013). It should be noted, however, that the number of conducted faunistic studies is higher in Fennoscandia than in southern Europe. Furthermore, some Boletina species display boreo-mountainous distribution pattern (see e.g. Kurina 2008), being absent from lowland areas; these both factors may obscure the latitudinal pattern presented here. 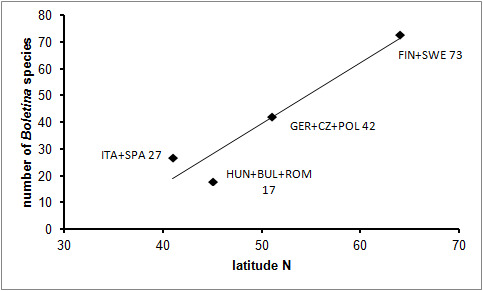 A graph showing the relationship of latitude (x-axis) to the number of Boletina species in continental Europe. ITA+SPA=Italy and Spain (27 spp), HUN+BUL+ROM=Hungary, Bulgaria and Romania (17 spp), GER+CZ+POL=Germany, Czech Republic and Poland (42 spp), FIN+SWE=Finland and Sweden (73 spp). Species numbers are based on Fauna Europaae (Chandler 2014) and subsequent additions, such asParvu 2002, Ševčík and Papp 2002, Parvu 2004, Schumann 2004, Kurina 2008, Ševčík and Vonička 2008, Bechev 2010. Fennoscandian (FIN+SWE) number is based on Kjaerandsen 2015, and unpublished records of 15 undescribed species (Kjaerandsen, Polevoi, Salmela & Söli, in prep.). The adjacent European countries were combined in order to reduce variation in their geographical areas. Latitudes represent rough midpoints of the respective groups of countries. Species of the genus can be distinguished by the following morphological characteristics: wing membrane without macrotrichia; mediotergite bare; laterotergite haired or bare; Sc ending in C; Sc2 present or absent; R4 absent; Sc ending in C beyond level of base of crossvein ta; mouthparts shorter than height of head (modified from Söli et al. 2000, see also Saigusa 1968). In addition the male hypopygium has a pair of ventral lobes, here termed as sternal submedian appendages of gonocoxites, that have great value in species identification. Gonostyli may consist of one (e.g. all species described here) or two lobes (e.g. Boletina dubia (Meigen), B. landrocki Edwards, B. polaris Lundström). 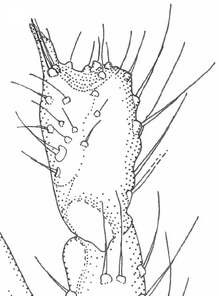 Among species with a single lobe of gonostylus, the gonostylus mostly has a setose and bulbose basal part (here termed as outer branch) and a narrower glabrous branch bearing a few strong apical spines or setae (inner branch). The cercus is conspicuous, bearing characteristic combs (i.e. stout darkened setae arranged in more or less regular rows or scattered on the dorsal surface). 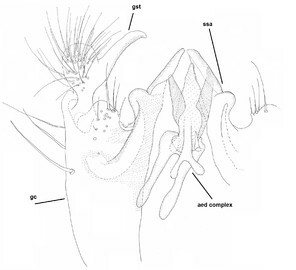 The aedaegal complex is more or less firmly attached to the sternal submedian appendage of gonocoxites via lateral branches or ventrodistal sclerites of the aedeagus (Sasakawa and Kimura 1974). Parameres are highly varied and mostly symmetrical (asymmetrical only in B. cornuta Zaitzev). However, the genus is paraphyletic (Martinsson et al. 2011), and monophyletic groups within the genus may deserve generic ranks of their own (see e.g. Martinsson and Kjaerandsen 2012). Immature stages of the genus are extremely poorly known. In fact, notes on larval stages or rearing records are available for only nine species (Suppl. material 2), all of which are European species. Based on these records, the species are associated with decaying wood, soil, leaf litter and liverworts; interestingly only one species has been once reared from fungi (Suillus bovinus, Boletales) (Suppl. material 2). However, some of these records may represent pupation places, not real larval microhabitats (​Martinsson et al. 2011). 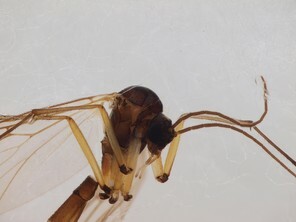 In the boreal zone, Boletina may be one of the most abundant groups of fungus gnats in entomological samples collected from forests (J. Salmela, pers.obs.). However, Boletina may also be abundant in treeless habitats such as mountains and mires (Edwards 1925, Jakovlev et al. 2014). In the present paper we describe four new Boletina species (three from Finland, one from Fennoscandia and Canada). In addition, one new synonymous name is proposed and one species is reported for the first time from the Nearctic region. All studied Fennoscandian specimens were obtained from Malaise trap samples and are stored in 70 % ethanol. Material deposited in CNC is dry and pinned. The morphological terminology used here mainly follows Söli 1997. Terminology of some special parts of male genitalia is explained in the figures. The following acronyms for museums and collections are used in the text: ZMUT – Zoological Museum, University of Turku, Turku, Finland; CNC – Canadian National Collection of Insects, Arachnids and Nematodes, Ottawa, Canada; JES – Private collection of Jukka Salmela, Rovaniemi, Finland; TZS - Tromsø Museum, The Arctic University of Norway, Tromsø, Norway. All specimens in JES and ZMUT are stored in 70 % ethanol, kept in 2 ml plastic vials with a screw cap and a rubber o-ring seal. Hypopygia of some specimens are kept in separate 0,5 ml microvials in glycerol. Digital photos were captured by Olympus E520 digital camera, attached to an Olympus SZX16 stereomicroscope using Deep Focus 3.1 and Quick PHOTOCAMERA 2.3 software. Layer photos were combined using Combine ZP software. Black and white drawings were produced by using Olympus BX51 microscope with a drawing tube. Measurements of the new species are given in Table 1. 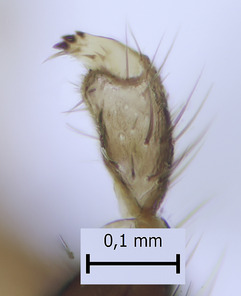 Measurements (µm) of the four new Boletina species. mid tibia 1725 1875 1125 n.a. mid 1st tarsomere 1025 1375 750 n.a. We also tried to extract DNA barcode (see e.g. Mutanen et al. 2012), as most of our specimens were stored in ethanol. These were sent to the Biodiversity Institute of Ontario, University of Guelph, Canada, for DNA extraction and sequencing. Unfortunately our specimens yielded either no DNA or resulting sequences (n=2) were most likely contaminated. These two COI mtDNA fragments showed affinities to taxa that are quite unrelated to the species that they were supposed to represent, and the results are thus ignored here. Boletina valteri Salmela, sp. n.
Head dark brown–black, mouthparts brown. Palpomeres 1–3 brownish, 4–5 lighter. Scape, pedicel and flagellomeres dark-brown (six basal flagellomeres present, Fig. 2a). Scutum dark-brown, laterally brown, with scattered light setae. Pleura brown, mediotergite, laterotergite, anepimeron, anepisternum and preepisternum glabrous. Coxae, femora and tibiae yellow, trochanters infuscated, tarsomeres brown, claws black. Mid-legs missing. Wing length 2.8 mm. Sc1, Sc2, Rs, ta, tb and M-stem bare, M1, M2, CuA1, CuA2 setose on ventral surface, stem of CuA bearing a few setae distally. Sc1 ending in costa above Rs. Costa extending beyond tip of R5 to approximately 1/3 of the distance between R5 and M1 (Fig. 2a). Base of posterior fork a little beyond base of M-stem. Halteres pale. Abdominal tergites and sternites brown, bearing light hairs. 9th tergite brown. Cercus with three combs (i.e. rows of dark-brown, stout setae): proximal row with 13–15, mid row with 17–18 and distal row with 11 setae; distal setae longer than mid or proximal setae (Fig. 2b). Sternal submedian appendages of gonocoxites as in Fig. 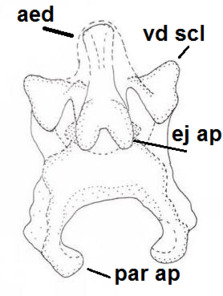 3a; there is a an accessory structure between submedian appendages, having a distinct U-shaped median notch (Fig. 4). Lobe of gonostylus pointed, bearing two black apical setae (Fig. 3a, b, c). Parameres almost straight (apices slightly bent), rather long and thin, tapering toward apices (Fig. 3d, e, f). Aedeagus in lateral view with a blunt tip (Fig. 3f), ejaculatory apodemes as in Fig. 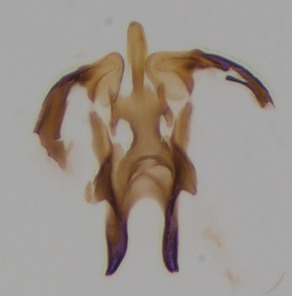 3d, e, f.
Boletina valteri Salmela sp.n., holotype male. b: 9th tergite and cerci, dorsal view. 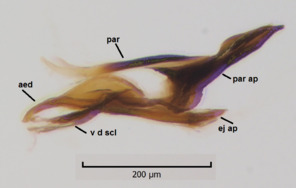 Boletina valteri Salmela sp.n., holotype male, details of hypopygium. Abbreviations: aed=aedeagus, ej ap=ejaculatory apodeme, par ap=parameral apodeme, par=paramere. d: Aedeagal complex, dorsal view. e: Aedeagal complex, ventral view. f: Aedeagal complex, lateral view. 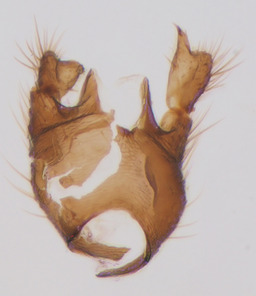 Boletina valteri Salmela sp.n., holotype male, a chitinized structure between submedian appendages of gonocoxites. Edges of this structure are clarified with dots. A small Boletina species with unpatterned wings and a monochromatic abdomen. The cercus has three rows of stout setae, and the parameres are long and thin. The lobe of gonostylus is pointed. The new species is externally somewhat similar to B. pallidula Edwards, but that species has two rows of setae on cercus and shorter inner branch of gonostylus. The species is named after Valter Keltikangas (1905-1990), Finnish forest researcher and professor. In his famous novel "Seitsemän tuntia erämaata" (1977) he recollected his expedition to the vast mires and forests of Pomokaira, the type locality of the new species. The name of the new species is a genitive. European, so far only known from central Finnish Lapland. The type locality is a Salix swamp with meso-eutrophic groundwater seepages, surrounded by an old-growth boreal forest, dominated by spruce (Picea abies ssp. obovata), birch (Betula sp. ), and bilberry (Vaccinium myrtillus) on the ground layer. The new species seems to be quite isolated from other known species of the genus. It has relatively short antennal flagellomeres (length:width ratio of the 2nd flagellomere is 2), long and straight parameres and inconspicuous parameral apodemes. The parameres are also moveable in their bases. The basal, paired projections of the aedeagal complex are here considered as ejaculatory apodemes. Even more striking is the presence of an accessory structure lying close to sternal submedian appendages of gonocoxites. This structure is perhaps a part of aedeagal complex, a highly specialized organ derived from ventrodistal sclerites of aedeagus. 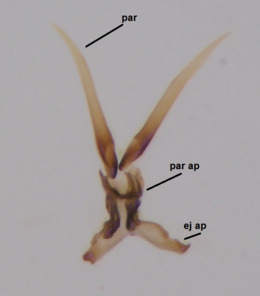 The new species is somewhat similar to B. pallidula, but in addition to the diffrences in male genitalia given above, B. pallidula has lighter body coloration, slightly longer flagellomeres and is lacking vein Sc2. Boletina kullervoi Salmela, sp. n.
Head black, mouthparts dark-brown (Fig. 5). Palpomeres 1–3 dark-brown, 4–5 lighter, but apex of palpomere 5 darkened. Scape, pedicel and flagellomeres dark-brown, except base of 1st flagellomere light brown (see Table 1). Scutum dark-brown, with scattered light setae. Pleura dark brown, mediotergite, laterotergite, anepimeron, anepisternum and preepisternum glabrous. Fore and mid coxae, all femora and tibiae yellow, trochanters black, tarsomeres brown, claws black; basal half of hind coxa dark brown. Wing length 4.8 mm. Sc1, Sc2, Rs, ta, tb and M-stem bare, M1, M2, CuA1, CuA2 and stem of CuA setose on ventral surface. Sc1 ending in costa little beyond Rs. Costa extending beyond tip of R5 only slightly (Fig. 5a). Halteres pale yellow. Abdominal tergites and sternites brown, bearing light hairs. 9th tergite dark-brown. Cercus ca. 1.2 times wider than long, with four more or less regular combs (i.e. rows of dark-brown, stout setae): proximal row with 5, second row with 14–15, third row 8–11 and distal row with 11–13 setae; setae of distal row a little longer than setae of proximal row (Fig. 6b). Apices of sternal submedian appendages of gonocoxites club-shaped, rounded (Fig. 6d, e, see Notes below). Inner branch of gonostylus rather long and narrow, bearing a black apical spine and a longer hyaline seta (Fig. 6c). Parameres short and straight (Fig. 6d, e, f). 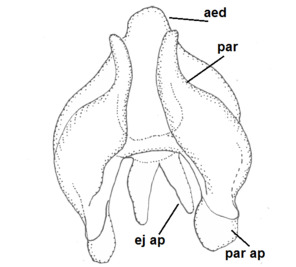 Parameral apodemes with lateral lobes (Fig. 6d). Aedeagus narrow, its apex curved (Fig. 6f). 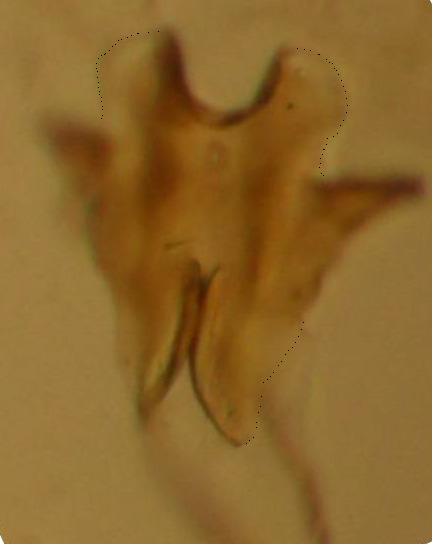 Ejaculatory apodeme with basal projection and paired ventrodistal sclerites. 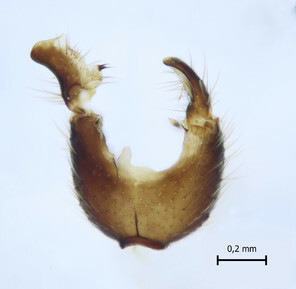 Boletina kullervoi Salmela sp.n., holotype male, habitus. 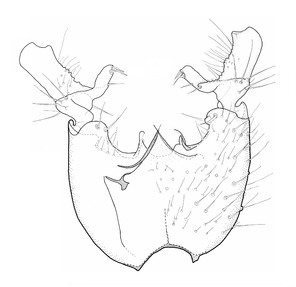 b: Thorax and head, antero-lateral view. Medium-sized Boletina which is externally similar to B. borealis Zetterstedt, wings unpatterned. 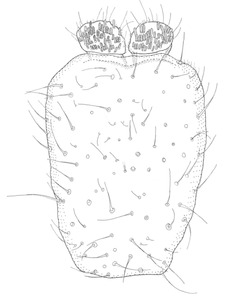 The new species has small, paired ventrodistal sclerites on the aedeagus, whereas B. borealis has larger sclerites. Parameres are short and widely separated, parameral apodemes having distinct lateral lobes. The species is named after Kullervo, the son of Kalervo. Kullervo is a tragic character in Kalevala, the Finnish national epic. Kullervo is also the first symphony composed by Jean Sibelius (1892). The name of the new species is a genitive. European, so far only known from eastern Finnish Lapland. Both collecting sites are pristine boreal forests. The collecting site in Törmäoja was a stream valley with lush vegetation, groundwater seepages and coniferous forest on the valley slopes. At Värriö the habitat was similar with the valley surrounded by sparse pine and spruce forest. The new species appears to be closest to B. borealis and related species, including B. intermedia Lundström and B. birulai Lundström. However, the new species is readily distinguished from these based on differences in male hypopygium. 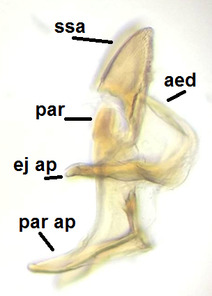 Sternal submedian appendages of B. kullervoi sp.n. are apically club-shaped, but more truncated among B. borealis and other species. Parameres of B. kullervoi sp.n. are short and widely separated, including lateral wing-like lobes on the parameral apodemes. Parameres of B. borealis and other species are longer, having no such lateral projections. Please also see Notes below. Boletina kullervoi sp.n. is characterized by the arching apices of the sternal submedian appendages of the gonocoxites. In ventral view the sternal submedian appendages appear to be truncated and slightly oblique, but in reality the apices are club-like, firmly attached to aedeagal complex. If one is trying to remove the aedeagal complex from the hypopygium, apices of sternal submedian appendages remain attached to the aedeagal complex. The ventrodistal sclerites of the ejaculatory apodeme are here termed as paired, because there are short apical and basal projections. However, further morphological study is needed to verify whether these appendages are homologous to similar structures among species such as B. borealis and B. hyperborea sp.n. Boletina hyperborea Salmela, sp. n.
Ogilvie Mountains, NE of Dawson City, North Fork Crossing, mile 43, Peel Plateau Rd. Ogilvie Mountains, NE of Dawson City, North Fork Crossing, mile 42, Peel Plateau Rd. Head dark brown, mouthparts brown. Palpomeres light-brown. Scape and pedicel dark-brown, 1st flagellomere light brown, other flagellomeres brown. Scutum brown, rather densely covered by light setae. Pleura brown, mediotergite, laterotergite, anepimeron, anepisternum and preepisternum glabrous. 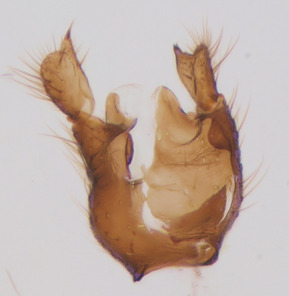 Coxae, femora and tibiae yellow, trochanters infuscated, tarsomeres brown, claws black. Wing length 4.5 mm. Sc1, Sc2, Rs, ta, tb and M-stem bare, M1, M2, CuA1, CuA2 setose on ventral surface, stem of CuA bearing a few setae distally. Sc1 ending in costa slightly before Rs. Costa extending beyond tip of R5 only slightly (Fig. 7). Halteres pale. Abdominal tergites and sternites brown, bearing light hairs. 9th tergite brown, covered by long brownish setae. Cercus ca. 1.7 times wider than long, with five more or less regular combs (i.e. rows of dark-brown, equally long stout setae), total number of setae ca. 120–130 (Fig. 8b). Sternal submedian appendages of gonocoxites apically truncated, rather narrow and bulging medially (Fig. 8a). Inner branch of gonostylus long and narrow, pointed, bearing a black apical spine. Aedeagal complex rather long and narrow (Fig. 8c, e). Parameres long and thin, not exceeding tip of aedeagus, apically incurved (Fig. 8c, d, f). Basal part of parameres dark, apices hyaline. Parameral apodemes stout, in lateral view widest medially (Fig. 8c, d). Ejaculatory apodeme basally bilobed (Fig. 8e). Aedeagus narrowing apically, having a hyaline membrane around the apex. Aedeagus with bare or non-spinose ventrodistal sclerites, serving as attachment points to sternal submedian appendages of gonocoxites. 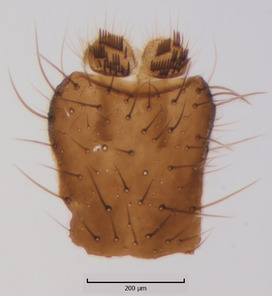 Boletina hyperborea Salmela sp.n., paratype male DIPT-JS-2014-0485, habitus, lateral view. Boletina hyperborea Salmela sp.n., details of male hypopygium, paratype DIPT-JS-2014-0014. Abbreviations: gst=gonostylus, ssa=sternal submedian appendage, gx=gonocoxite, aed complex=aedeagal complex, aed=aedeagus, v d scl=ventrodistal sclerite, ej ap=ejaculatory apodeme, par ap=parameral apodeme, par=paramere. c: Aedeagal complex, lateral view. d: Aedeagal complex, lateral view. e: Aedeagal complex, dorsal view. f: Aedeagal complex, ventral view. Medium-sized Boletina belonging to a group of species around B. borealis Zetterstedt. Wings and abdomen unpatterned. Sternal submedian appendages of gonocoxites bulging medially. Parameres rather long and thin, apically incurved, bare. Parameral apodemes are wide in lateral view and the aedeagus is coated by a transparent membrane. The species is superficially similar to B. hymenophalloides Sasakawa & Kimura; that species is characterized by 1) wide and apically spinulose parameres, their apices reaching the tip of the aedeagus, 2) a more narrow aedeagus and 3) a more extensive membrane around the aedeagus. It is most likely that B. hymenophalloides is not closely related to B. borealis and similar-looking species. Hyperborea (an noun in apposition) is taken from the Greek mythology, meaning the far north. Northern parts of Fennoscandia (Finland, Norway, Sweden) and Canada. In Fennoscandia the species have been observed from the northern boreal zone and from the subarctic ecoregion. In Canada it has been observed from the Ogilvie Mountains in the Yukon territory, which is in the subarctic ecoregion. The collecting sites are boreal forests and alpine wetlands. Joutenoja and Värriö are headwater streams, characterized by groundwater seepages and surrounded by coniferous forests. Toskaljärvi is an oroarctic, alpine sloping rich-fen, dominated by brown mosses. Boletina nuortti Salmela, sp. n.
Head dark brown, mouthparts brown and palpomeres brown. Scape and pedicel dark-brown, flagellomeres brown. Scutum brown, rather densely covered by light setae. Pleura brown, mediotergite, laterotergite, anepimeron, anepisternum and preepisternum glabrous. Coxae, femora and tibiae yellow, trochanters infuscated, tarsomeres light-brown, claws black. Wing length 3.4 mm. Sc1, Sc2, Rs, ta, tb, CuA and M-stem bare, apical halves of M1, M2, CuA1 and CuA2 setose on ventral surface. Sc1 ending in costa before Rs. Costa extending beyond tip of R5 to approximately 1/3 of the distance between R5 and M1. Halteres pale. Abdominal tergites and sternites brown, bearing dark hairs. 9th tergite brown, covered by brownish setae. Cercus ca. 1.75 times wider than long, with ca. four irregular combs (i.e. rows of dark-brown, equally long stout setae), total number of setae ca. 50–60 (Fig. 9b). 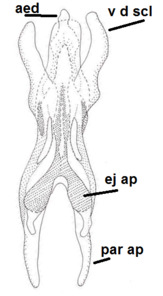 Sternal submedian appendages of gonocoxites apically rounded, short and separated by a Y-shaped cleft (Fig. 9a). Gonostylus appearing unibranched, but is divided on inner and outer branches (Fig. 10a, b). Outer branch rather inconspicuous, bearing thin and rather short mesal hairs. Inner branch short, mostly glabrous, with a few small subapical setae, two or three black apical spines and a longer hyaline seta. Aedeagal complex rather short and wide (Fig. 10c, d, e). Parameres monochromatic, short and stout, tapering apically, their apices not exceeding tip of aedeagus (Fig. 10d). Parameral apodemes very wide in lateral view (Fig. 10e). Ejaculatory apodeme consisting of two short and wide basal lobes. Aedeagus with short ventrodistal sclerites, apex of aedeagus down-curved, coated by a hyaline membrane (Fig. 10c, e). 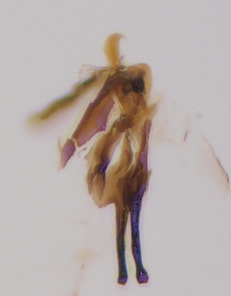 Boletina nuortti Salmela sp.n., holotype male. b: 9th tergite, dorsal view. 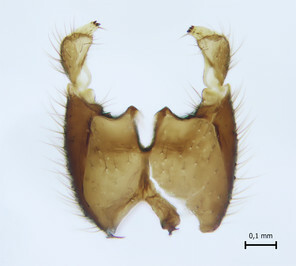 Boletina nuortti Salmela sp.n., holotype male. Abbreviations: aed=aedeagus, ej ap=ejaculatory apodeme, par ap=parameral apodeme, par=paramere, vd scl=ventro distal sclerite. c: Aedeagal complex, ventral view. e: Aedeagal complex, lateral view. A medium-sized Boletina species similar to B. silvatica Dziedzicki, amongst other species. Apices of the sternal submedian appendages are small, rounded and separated by a Y-shaped cleft. The new species is lacking dorsal projections on the gonostylus, as typical for species such as B. silvatica, B. subtriangularis Polevoi & Hedmark and B. triangularis Polevoi. Parameres of the new species are also distinctly shorter than those of the three above mentioned species. Wings unpatterned. The name of the new species is derived from the River Nuortti, a large tributary of the River Tuuloma. Nuortti is derived from north Sami word (nuorti), meaning east; the River Nuortti flows in a NE direction from Finland to Russia. The name of the new species is a noun in apposition. European, so far only known from Törmäoja conservation area, eastern Finnish Lapland. The type locality is a birch dominated boreal forest, bilberry and cowberry (Vaccinium vitis-idaea) on the ground layer. The new species is reminiscent of B. silvatica and related species, especially the shape of the aedeagus which indicates an affinity to B. nuortti sp.n. within this species group. However, species related to B. silvatica have a very deep sternal cleft of gonocoxites, whereas the cleft in B. nuortti sp.n. is not exceeding the half length of the gonocoxites. 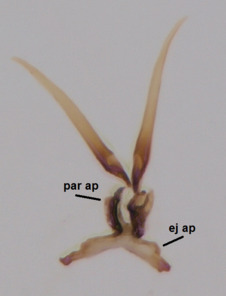 In addition, B. silvatica and related species possess a dorsal projection on gonostylus, a character absent on B. nuortti sp.n. Thirdly, parameres of the new species are relatively short; parameres of B. silvatica and related species greatly exceed the length of aedeagus (see e.g. Polevoi and Hedmark 2004). 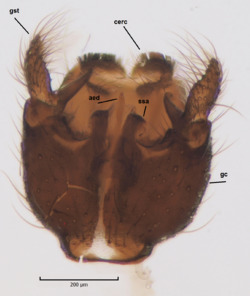 Axel Heiberg Island, Wolf R.
Male: Head, mouthparts and palpomeres black. Scape, pedicel and flagellomeres dark-brown – black. Scutum dark-brown, with scattered light setae. Pleura dark brown, mediotergite, laterotergite, anepimeron, anepisternum and preepisternum glabrous. Fore coxae, all femora and tibiae yellow, trochanters black, tarsomeres brown, claws black. Mid and hind coxae dark-brown. Wing length 4.8 mm. Sc1, Sc2, Rs, ta, tb and M-stem bare, apical halves of M1, M2 and CuA1, entire CuA2 and stem of CuA setose on dorsal surface. Sc1 ending in costa little before Rs. Costa extending beyond tip of R5 to approximately 1/3 of the distance between R5 and M1. Halteres pale yellow. Abdominal tergites and sternites dark-brown, bearing light hairs. 9th tergite black. Cercus ca. 1.4 times wider than long, having basally 3–4 irregular combs (i.e. rows of dark-brown, stout setae): total number of such setae 37–40. Apex of cercus with a distinct comb, number of setae 14–15. Sternal submedian appendages of gonocoxites short, apically rounded, diverging, pubescent (Fig. 11c). Gonocoxite apicomesally with two black spines (Fig. 11a). 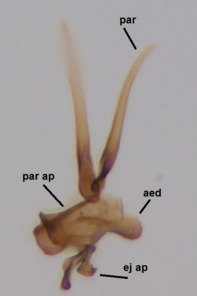 Inner branch of gonostylus pollex-like, bearing two long black apical setae and a black spine. 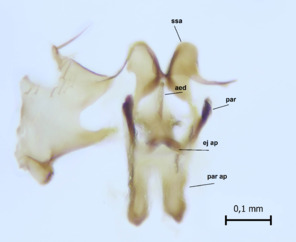 Outer branch of gonostylus rectangular, widest subapically, with a modest apical peak (Fig. 11a, b). Mesal edge of gonostylus hairy. Parameres short and straight (Fig. 11c). Parameral apodemes + parameres resembling the letter L in lateral view (Fig. 11d). Aedeagus short and curved (Fig. 11d). Ejaculatory apodeme with basal projections. Gonocoxite internally with a narrow, pointed projection (Fig. 11a). Close to this projection are two hyaline projections, bearing weak bristles; this latter projection is part of aedeagal complex. Boletina arctica Holmgren, figures are based on two male specimens from Axel Heiberg Island, Canada. Abbreviations: aed=aedeagus, ej ap=ejaculatory apodeme, par ap=parameral apodeme, par=paramere, ssa=sternal submedian appendage. a: Hypopygium, ventral view. Sternal submedian appendages of gonogoxites are omitted. b: Hypopygium, ventral view. Sternal submedian appendages of gonogoxites are omitted. c: Aedeagal complex, dorsal view. 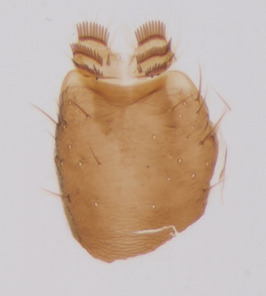 Boletina arctica has been recorded from Greenland (Holmgren 1872, Söli et al. 2015), Arctic Russia (Zaitzev 1994) and Akpatok Island, Hudson Strait, low arctic zone of Canada (Edwards 1933). Here we report the species from the high arctic zone, Axel Heiberg Island, Canada. Given the rarity of this species, B. arctica has been illustrated rather frequently in taxonomic literature. The first to illustrate this species was Rübsaamen (Rübsaamen 1898), but instead of B. arctica, he actually figured B. digitata Lundström (or some related species of this complex, see Suppl. material 1). 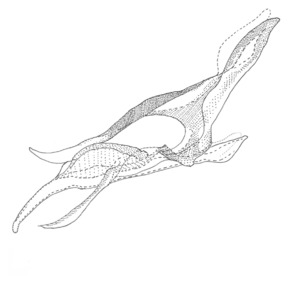 Johannsen (Johannsen 1911) copied Rübsaamen's illustration of B. arctica and gave no additional occurrence data. Later Lundström (Lundström 1912) provided good figures, based on material loaned from ZMUC, Copenhagen, originally collected from Greenland. 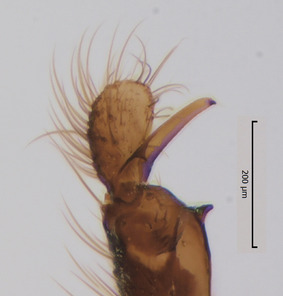 It is not clear whether a type specimen was examined, but most likely it was a non-type male, since the type material of B. arctica is not deposited in ZMUC (http://www.zmuc.dk/EntoWeb/collections-databaser/Diptera/Mycetophilidae%20all.htm). Hence, authors after Lundström have followed his interpretation of B. arctica. Edwards (Edwards 1933) was actually the first to report this species from North America (Akpatok Island), he illustrated Boletina arctica var. According to Edwards, his specimens were slightly different from a male specimen collected from Greenland. 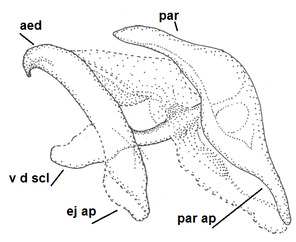 However, such differences on the outline of the gonostylus are due to aspect of the gonostylus to the viewer (Fig. 11b). 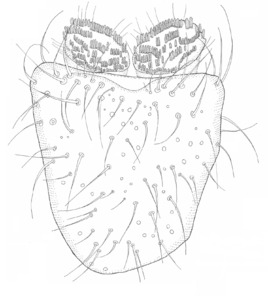 Boletina arctica was also illustrated by Zaitzev (Zaitzev 1994) and recently by Söli et al. (Söli et al. 2015). The species possesses some unique characters that have been misinterpreted in the literature. First of all, B. arctica has no sharply pointed parameres (cf. Edwards 1933​, p. 612). Lundström, Edwards and Zaitzev have illustrated these sharply-pointed projections that actually stem from the inner lateral margin of the gonocoxite. Furthermore, close to these projections lie two spinose, hyaline projections that orginate from the aedeagal complex. The parameres themselves are inconspicuous, short and straight. Holarctic, here reported for the first time from the Nearctic region. The species is known from North Europe, Central European mountains (see Jakovlev et al. 2014 and references therein) and Japan (Hokkaido, Sasakawa and Kimura 1974​). Yukon, North Fork Pass, Ogilvie Mts. Holarctic, here reported for the first time from Canada. The species was described from the arctic coast of Russia (New Siberian Islands and around Taimur, Lundström 1915), and was later rediscovered from arctic Russia (Dickson, New Siberian Islands, Zaitzev 1994). The species is also reported from Poland (Pommern, Landrock 1940) and Germany (Bavaria, Plassmann and Schacht 1999) and from Alaska in the USA (Hackman et al. 1988). 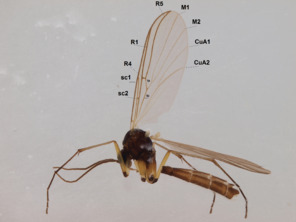 However, the record from Germany is erroneous (misidentification, the male specimen is an undescribed species close to B. nigricoxa Staeger and B. cincticornis (Walker), det. J. Salmela) and the Polish record should also be re-examined and verified. Furthermore, the record of B. birulai larvae from Port Barrow, Alaska originally implicated in causing human myiasis to an entomologist (Casterline 1954), should be treated with caution. 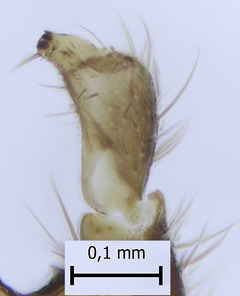 Larva of B. birulai has not been described and it remains unclear whether B. birulai or some other species was involved. Boletina subnitidula Sasakawa, 1994: 298 (Sasakawa 1994), syn. n.
Boletina pallidula was described by Edwards (Edwards 1925) from the British Isles, and the male hypopygium has been later illustrated by Hutson et al. 1980 and Zaitzev 1994. The species has a European range, including Fennoscandia, northern Russia, Central Europe, Bulgaria and Hungary (Chandler 2014). Sasakawa (Sasakawa 1994) described B. subnitidula from the Chiba prefekture in Japan based on material collected from Arisema serratum flowers. 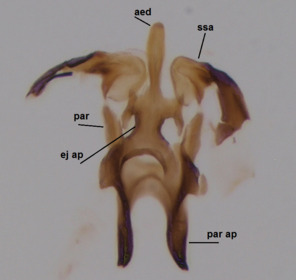 Sasakawa's description is very detailed, including illustrations on the male hypopygium, and hence we propose it as a junior synonym of B. pallidula. In his discussion on B. subnitidula Sasakawa (Sasakawa 1994, p. 300) does not mention B. pallidula; instead, he compares his new species to rather distant species B. nitida Grzegorzek and B. dispecta Dziedzicki. It is likely that Sasakawa was not aware of B. pallidula while describing B. subnitidula. JS is grateful to Jeff Cummings and Scott Brooks (CNC) for allowing access to Boletina specimens at the CNC in February 2015. Jostein Kjaerandsen (TZS) shared his records of Boletina hyperborea sp.n. Thanks to Matti Mäkilä and Värriö Research Station for their help in servicing Malaise traps in 2013–2014. Peter Chandler, Levente-Peter Kolcsar, Björn Rulik and Jan Ševčík commented national species lists used in Fig. 1. Dieter Doczkal (Zoologische Staatsammlung München) loaned a Bavarian Boletina specimen from ZSM Diptera collection. Comments by Pete Boardman (Shrewsbury), Robert Deady (Cork), Peter Chandler (Melksham) and Olavi Kurina (Tartu) improved the manuscript. JS wrote the ms. AS prepared drawings. KMK took some of the layer photos. Résultats scientifiques de l'Expédition des frères Kusnecov (Kouznetzov) à l'Oural arctique en 1909, sous la direction de H. Backlund. Livr. 7 (Diptera). Zap. imp. Akad. Nauk (VIII) cl. phys.-math.
. http://www.fauna-eu.org/cit. Accession date: 2015 6 09. British fungus-gnats (Diptera, Mycetophilidae). With a revised generic classiﬁcation of the family. The fungus gnats of North America, part III.
. http://sciaroidea.info/node/48341. Accession date: 2015 6 09. Travaux du Museum National d'Histoire Naturelle "Grigore Antipa"
The genus Boletina Staeger from Taiwan (Diptera Mycetophilidae). 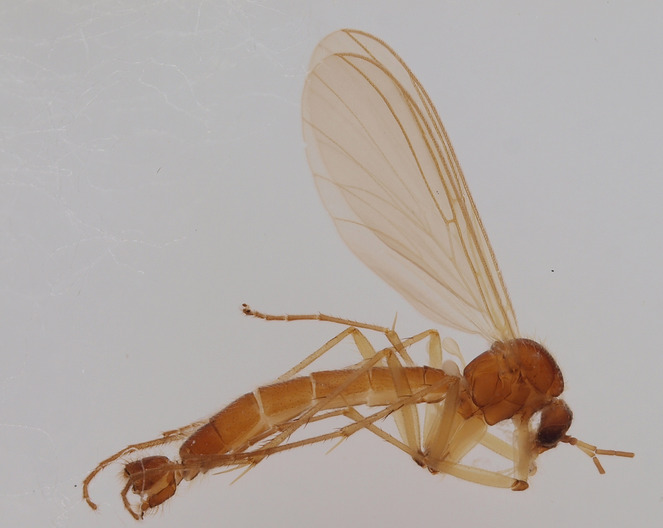 Mycetophilidae (Diptera): additions and corrections to the "Checklist of the Diptera of Hungary"
The adult morphology of Mycetophilidae (s. str. ), with a tentative phylogeny of the family (Diptera, Sciaroidea). 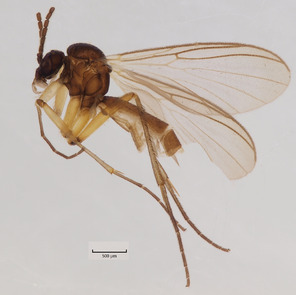 Fungus gnats of the fauna of Russia and adjacent regions. Part 1. Diptera Scandinaviæ disposita et descripta. Auctore Ph. D: re Johanne Wilhelmo Zetterstedt. A list of described Boletina species, including biogeographic range and preliminary comments on taxonomy. Ecological information on Boletina immature stages (larval records or rearings), extracted from literature.